On the road to Pakistan (Route 45) we crossed this handsome concrete and masonry bridge over a dry creek bed. This region is called the Khutch and the inhabitants live in small villages. The men (to my eyes) had a pleasant life of leading their flocks of goats and sheep around while the women did most of the actual work (carrying pots of water on their heads, pounding their clothes clean in rivers, cooking, taking care of the kids, while managing to look lovely in their beautiful saris). Actually, its not so different from the life of my wife and I, except I push numbers instead of goats and get paid more for my labor. Gujurat is the fundamentalist religious region of the Jains who have created a delicious vegetarian diet with wonderful curries. No alcohol to accompany your meals though unless you want to drive south to a former Portuguese colony along the coast that is allowed to sell big cold bottles of Kingfisher beer. Despite the calm pastoral life of the region, local politicians sometimes incite violence against the Moslem minority. 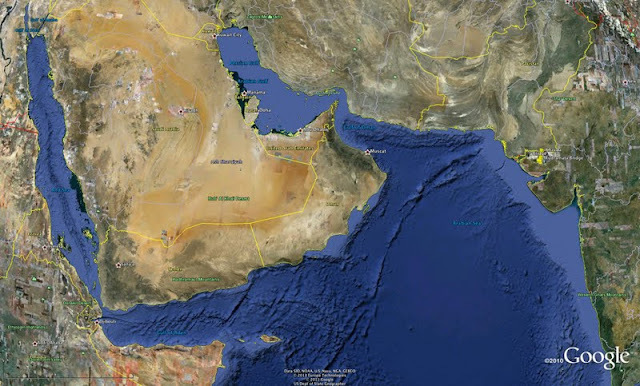 Moreover, Gujurat is on the Arabian Sea near the Gulf of Oman (with their oil tankers) and near the Gulf of Aden (with their pirates). India's Bridges: Bridge on Route 45 to Khavda, Gujarat by Mark Yashinsky is licensed under a Creative Commons Attribution-NonCommercial-NoDerivs 3.0 Unported License.